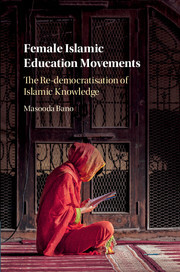 Female Islamic Education Movements: The Re-democratisation of Islamic Knowledge – a new book by Masooda Bano, published in September 2017 with Cambridge University Press, explores the significance of female Islamic education movements. Since the 1970s, movements aimed at giving Muslim women access to the serious study of Islamic texts have emerged across the world. In the book, Masooda Bano argues that it is within these education movements that the creative spirit that marked the rise and consolidation of Islam, whereby Islam inspired serious intellectual engagement to create optimal societal institutions, can be found. Drawing on rich ethnographic material from Pakistan, northern Nigeria and Syria, Dr Bano questions the restricted notion of agency associated with these movements, exploring the educational networks which have attracted educated, professional and culturally progressive Muslim women to textual study, thus helping to reverse one of the most damaging legacies of colonial rule in Muslim societies: the isolation of modern and Islamic knowledge. With its comparative approach, the book will appeal to those studying and researching the role of women across Africa, the Middle East and South Asia, as well as the wider Muslim world. To preview Chapter 1, please click here.